≈ All songs written and composed by Bradford Cox except for "The Missing'' written by Lockett Pundt. ≈ Bradford Cox's music is the stuff of an obsessive and unquiet mind. Everything about the singer's approach to music — whether he's dumping four discs' worth of home recordings onto the Internet with little fanfare or smearing fake blood onto his spindly, dress-clad body onstage — has a chaotic, haunted quality to it, even in painstakingly crafted recordings that layer his sound with atmospheric psychedelia. ≈ All of which makes Monomania a perfect title for an album by Cox's band Deerhunter: A single-minded obsession with music is so clearly what's kept him intact and whole throughout his adult life. But this particular collection, the sound of which he describes as "nocturnal garage," has a dirtier, wirier, looser and less fussed-over feel than he's often cultivated in recent years. Five studio albums into Deerhunter's existence, Monomania (out May 7) captures Cox's gift for self-laceration and unpredictability, but it moves in a less studio-bound direction, closer to the raw and unhinged spirit of his live shows. ≈ Monomania's gnarly dissonance leaves a bit less room than usual for glimmers of beauty — though they shine through in a few haunting tracks like "The Missing" — as Deerhunter opts more often for the raw, noisy, slurred and basement-friendly feel of "Pensacola." Elsewhere, "Blue Agent" meets somewhere on Deerhunter's continuum between sideways prettiness and the sort of thorniness that ensures arm's-length distance. Even as its sound continues to shift unpredictably, Deerhunter has maintained that balance throughout its fruitful run — no small task, coming from a man whose entire artistic persona is rooted in an understanding that balance doesn't come easy, even on the best days. ≈ Forever in pursuit of drama and difference, frontman Brandon Cox surrenders himself to his rock ’n’ roll monomania on Deerhunter’s fifth album by breaking down the sound of his revered Atlanta band. Up through album four, the 2010 tour de force “Halcyon Days,” the rail-thin, 6-foot-4 singer and his shifting lineup had built up the contradictory concept of “ambient punk” until they towered above an overpopulated and under-differentiated indie-rock scene in which everyone also toys with distorted vocals, dreamy textures, opaque lyrics, arty tempo shifts, and ringing guitar riffs. Now Deerhunter risks that distinction by careening both into mechanized din and spare lo-fi wispiness. ≈ Bigmouth strikes again: the latest target of Bradford Cox's verbal jabs was none other than Morrissey himself, but this particular barrage had a precision of intent that went overlooked by most online gawkers. "Have you ever read Morrissey's description of the Ramones?," he asked Buzzfeed. "I will always be on Team Joey, and Team Dee Dee. I come from America, where Bo Diddley was born!" While Deerhunter's always had a thing for indie rock advocacy, Cox's pointed patriotism was a new kind of stump speech, and in light of Monomania, his typically hilarious candor doubled as media savvy. On Deerhunter’s fifth album, they almost completely jettison the dreamy ambience that tempered even their noisiest work for straight-up raw, bleeding garage rock and populate these songs with junkyards, leather jackets, and motorcycles. The message from Deerhunter: We’re an American band. ≈ So adjust your expectations accordingly, and if this sounds like the protracted playacting usually associated with Cox's work as Atlas Sound, you’re on the right track. The stable democracy of the past few Deerhunter albums has been upended; Josh Fauver left the band, and besides writing most of “Nothing Ever Happened”, his basslines kept Deerhunter rooted in proper rock. Meanwhile, after increasingly proving himself to be a top-notch songwriter in his own right, Lockett Pundt took advantage of a rare year in which Cox released no new music by dropping the excellent Spooky Action At A Distance as Lotus Plaza in 2012. His sole contribution on Monomania is “The Missing”, a fine piece of wistful, ringing indie pop that gets placed between “Leather Jacket II” and “Pensacola”, the album’s raunchiest songs. ≈ It could easily be seen as Cox defending his turf, if not for a hazy, meditative stretch during the middle of Monomania that sounds like his take on Lotus Plaza. ≈ But while the songwriting power has become centralized, Monomania as a whole represents Deerhunter’s attempt to get outside themselves. This is particularly true of Cox; whereas on Cryptograms’ “Hazel St.”, he imagined what it might be like to fit in with the normal kids during his childhood in Georgia, years later, this dynamic is fully inverted and he’s found a group of outcasts that’s emboldened in their idiosyncratic embrace of a Dixie upbringing. You can hear the influence of neighbors/collaborators Black Lips in dirtbag storytelling like “Pensacola”, or just in the plain fact that Monomania is the first Deerhunter album that would be welcomed in a dive bar. Their previous physicality was defined by coiled intensity and quick strikes, whereas here they swagger and flex beer muscles. The perverted classic rawk riffs of “Neon Junkyard” and “Leather Jacket II” twist and yowl while “Back to the Middle” and “Dream Captain” are so immediately accessible, they could somehow come off as beneath Deerhunter. ≈ The more prevalent inspiration comes from fellow Athenian and mentor Michael Stipe; you can hear echoes of R.E.M.’s Monster in both the obscene distortion and the decision to follow up their richest, most rococo record with a defiant squall. Cox similarly plays against his reputation given the opportunity, using winks and irony to deviate from the impression that his band’s music is somewhat humorless and sexless. It’s every bit as confrontational as Deerhunter in their dress-wearing, blog-attacking days, only more fun. This can manifest in the glammy stream-of-consciousness from Monomania’s opening duo (“I am the Queen of Bass,” he announces on “Leather Jacket II”), or any of the first-person narratives that make good on his purported Hank Williams and Bo Diddley listening. Taking as many liberties with “Werewolves of London” as Kid Rock, “Dream Captain” might come off as puerile southern comfort if it wasn’t such an obvious defilement of it — bratty boasts like “I’m a boy, man/ And you’re a man, man” are tough to hear as anything other than comedy. Likewise, on “Pensacola”, an unfaithful woman leaves a Greyhound-riding somebody who is clearly not Bradford Cox with “a bald head and trouble.” Is it unfair that Deerhunter can get away with these because they’re Deerhunter, whereas it’s pure shlock from any number of southern rock revivalists? Perhaps, but having a laugh at one's own expense is hardly the most egregious form of an earned indulgence. ≈ But while Monomania as a whole is an unpredictable fulfillment of an unforeseen whim, it’s Deerhunter’s least revelatory and surprising album on a song-by-song basis. There isn’t a clear showstopper along the lines of “Helicopter” or “Nothing Ever Happened”, though the title track makes an admirable effort. They’ve always had a knack for mantras, and after a verse of plaintive gospel shouts (“Come on God, hear my sick prayer/ If you can’t, send me an angel!”), the nagging phonetics of “mono, monomania” get repeated ad infinitum before dissolving into white noise, motorcycle revving, and a soap opera device that Deerhunter makes frequent use of: after all this time, Cox unexpectedly wakes up. ≈ “I was a dream of myself,” Cox admits during “Nitebike”, a startling confessional of nothing more than his reverbed vocals and acoustic guitar. Perhaps taking another step back towards the medical maladies that pervaded both his youth and early Deerhunter, he imagines himself on his Big Wheels, “On the cusp of a breakthrough/ When they took me out/ And stuck it in/ It went so deep, man.” Another line gets repeated in greater detail on the Baudelaire-referencing closer “Punk (La Vie Antérieure)”, where Cox muses, “For a year, I was queer/ I had conquered all my fears/ Not alone anymore/ But I found it such a bore.” It feels something like Cox’s “All Apologies”, a litany of wearied, bemused dissatisfaction with everything that he presumed might save him — getting drunk, being punk, friends, lovers. The plainspoken finality of “Punk” suggests it’s not just a closure on Monomania, but of everything that preceded it. ≈ And that could be disappointing for a lot of people since Monomania is the first Deerhunter record that isn’t a quantifiable leap from what came before; the narrative and artistic arc that ran from Cryptograms to Halcyon Digest was clear and upward, their diametrically opposed centrist indie songwriting and diffuse, noisy ambience eventually converging into a brilliant horizon point. While a knocked-out, “back to basics” approach makes a lot sense as the follow-up to Halcyon Digest, it adheres to someone else’s idea of “basics” and follows the longest break between Deerhunter albums. But Monomania is certainly a strong effort on its own merits, and more importantly, they’ve avoided making their deflating “diminishing returns” record — their King of Limbs, Centipede Hz, Transference, Sky Blue Sky, etc. — that casts doubts about whether they’ve gone too far down the same path. They’ve pulled off something admirable in making an illogical left turn feel like the logical next step where one didn’t exist. For the first time since Cryptograms, Deerhunter’s next move will be harder to predict than Cox’s. 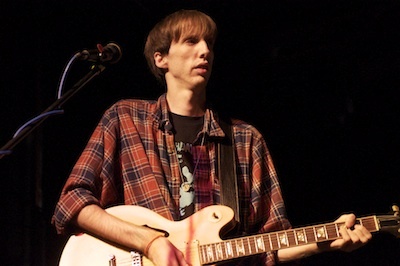 ≈ When playing with Deerhunter, Bradford will usually run his guitars through a Vox AC30 amplifier, and occasionally a Marshall half-stack or a Fender Hot Rod DeVille 410. ≈ Cox was born with the genetic disorder Marfan syndrome. As a teenager, he dropped out of high school (although later earned a GED) and his parents divorced, leaving him "to live in my childhood home alone. I literally lived in this large suburban house by myself." Cox has called his changing music taste growing up reflective of his life and mental state. Around the age of ten, Cox's disorder began to affect his body in more visible ways; this is the point at which he "first started looking awkward." With no friends, Cox became interested in how music could sound "heartbreaking or nostalgic or melancholy"; he identified with the title character of the film Edward Scissorhands, and especially enjoyed the soundtrack, which was composed by Danny Elfman. Cox's tastes shifted to music that was more "monotonous or hypnotic", such as the Stereolab album Transient Random-Noise Bursts with Announcements. Around twenty years of age, his life situation brought about "a period", during which he became "only interested in this certain sort of suburban psychedelic pastoral thing. It was escapism. I didn't want as much emotional manipulation. It's kind of the opposite of Edward Scissorhands."